We’re profiling team members at Pear Tree Greetings to show you which unique Christmas card ideas they chose and how they personalized them. About Shelly: I am 23 and just finishing college. I am an intern at Pear Tree Greetings and am hoping for a full-time job here someday (hint, hint)! I wanted to send a Christmas card to my family and friends to give them a quick update on how I am and what I have been doing. It is just another step to being in the real world! Why did you choose this card? I chose this card because I love that it will showcase my recipe! I love to bake, and I always get requests for recipes, so why not just send my new favorite recipe along to my family and friends so they can make their own little treats? I also love that I can change the colors and add photos to really show off my fancy Christmas treats and yummy cupcakes! Did you do anything special to personalize it? I put my new favorite recipe for Christmas cookies on the front and changed the background color to match the frosting on the cookies. 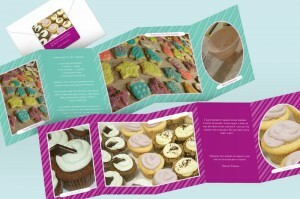 Then I put photos of my cupcakes on the back and changed that background color to match the frosting on those. I think the two colors will look great together when it gets folded up! Last, but not least, I added a ‘sweet’ Christmas greeting. Like Shelly’s unique Christmas card ideas? Find your perfect holiday card with our Holiday Cards MatchFinder.